Since 1965 Lance has been building America's most popular truck campers. And today, many of them are still on the road - a true testament to the company's philosophy that Quality Comes First. Now Lance is making its mark with travel trailers that are quickly becoming the new ultra-light towable of choice. Based in California - the nation's most demanding state for building safe products - Lance manufactures from a State-of-the-Art Production Facility - a 141,000 square foot, 22 acre campus - campus because Lance continues to learn from its dealers and from every single customer who provides ongoing feedback for improvement and new product design. Ideas born from this process include LanceLock™, the use of Azdel™, Euro-Lite™ and the removal of all Mercury making for an eco-friendly, toxin-free RV. These are just a few of the examples of our advanced engineering that contributes to a quality product. That's why for the last decade, Lance has won the prestigious DSI Award (Dealer Satisfaction Index) for quality almost every year. We're also rated Best in Owner Satisfaction by our customers who are often repeat buyers and a source of referrals for new customers. And recently, Consumers Digest awarded the entire Lance line their highest rating. It doesn't stop there. To be a Lance dealer requires commitment. Every dealer goes through extensive training giving us the comprehensive authorized Dealership Network across the United States and Canada. Whether a first-time or repeat customer, in need of service or camper education - our network is always there for you. 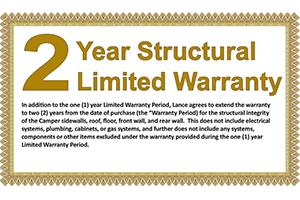 In addition to the one(1) year Limited Warranty Period, Lance agrees to extend the warranty to two (2) years. "Discovering The Lance Difference: A Video Series"